For several years now, I’ve been using ImageShack to host my images. The service quality was good enough, despite occasional hiccups, but when imgur came around, I gladly switched. That said, I was still satisfied with ImageShack and would use it to host something every once in a while. Until last week, when I learned of their decision to turn evil and extort money from their users. 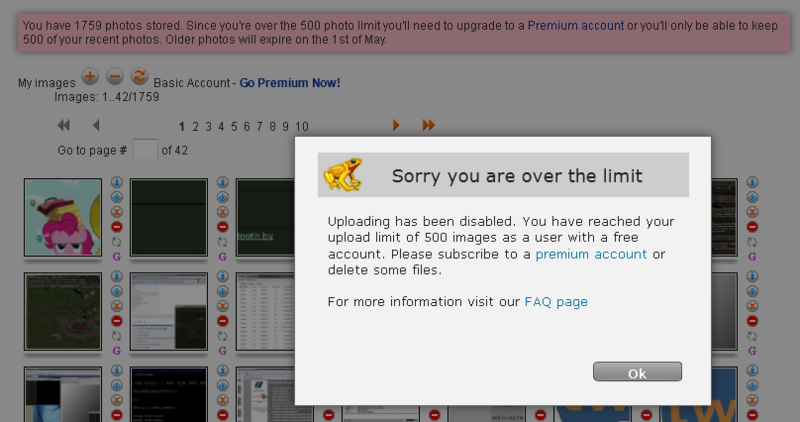 ImageShack’s extortion scheme: pay up or else we’ll delete images you uploaded before we changed the rules. Instead of bending over and paying up, I’ve decided to simply stop using their services, which brings me to the reason for this post: the tool I needed to extract all my images from ImageShack. Without further ado, ImageShack Dumper was written in ruby, its source is available on github. For those less technology-savvy, a Windows executable that doesn’t require installation of anything else is here. Come peek your head in over at DCloneIRC #europe-dclone again some time and say hi! © 2019 /dev/krzaq | Theme: Storto by CrestaProject WordPress Themes. Modified by KrzaQ. | 7 queries, 0.349 seconds.